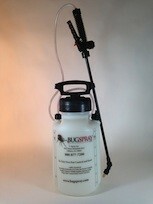 Hi- I have been reading through all the great information you have on repelling wasps (and hopefully mosquitos). We have a small wood porch off the back of our house where we see most of the activity. I am a little unsure which method is best for this situation – the dust or the Cypermethrin spray? My understanding is the dust works for a longer period of time so is there some advantage to using the spray as well or is it really just 2 ways of doing the same thing? Thanks! In fact the two products are quite different but in general, they will work together well as a team and this is especially true for wasps. The difference between the two is where they work. DRIONE DUST is applied to cracks, crevices and voids using a good HAND DUSTER. In these locations where the dust is well protected, treatments can last 6-12 months making it a great asset in any war against pests like wasps. CYPERMETHRIN is for exposed surfaces like the homes siding, underneath overhangs and gutters and basically for areas where surface nesting wasps like to exploit. Use 1 oz per gallon per 500 sq/ft of surface area. Treatments will last 30 days and during this time the treatment should repel all pests that would normally try to land on these areas. Use a good PUMP SPRAYER to apply it. Our sprayer will reach up 15-20 feet when the nozzle is set to a pin stream. If you have to reach up more than 20 feet, get a HOSE END SPRAYER. Now which product will help your problem the most is more dependent on which wasps you have active. Species like the common RED WASP or YELLOW JACKET will look to nest in cracks and crevices. You’ll see them active in these spots spring, summer and fall and once good nest areas are identified, they’ll be “marked” with scent making them easy to find every new year. Treat these areas with the Drione once a year and you won’t have to worry about any wasps finding them again. Other species of wasp like Paper Wasps or BALD FACED HORNETS will build nests on the homes exterior. MUD DAUBERS do the same. For these wasps, the Cypermethrin will be better suited. 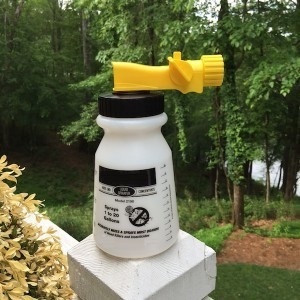 In summary, since homes can be targeted by so many different species of wasps, using a combination of both Drione and Cypermethrin will usually prove to be the best overall treatment program.